Kids, by their very nature, are packed full of surprises. They can entertain you one day, make you cry out in frustration the next, and then amaze you the day after that. Put simply, they’re notoriously unpredictable. Even so, little Addie Bryan’s actions have raised more than just a few eyebrows. Having been born with a rare bone disorder called Larsen Syndrome – which contorted her legs and made it impossible for her to bend them – she underwent a few years worth of extensive medical help (for free) at Texas Scottish Rite Hospital for Children. It’s thanks to the help of the good doctors that she can now not just walk, but run, and so decided she wanted a way to pay back the hospital for all its incredible help. With Addie’s birthday on the horizon she would have been forgiven for asking for new toys, or perhaps the latest gadget sure to make her popular at school. 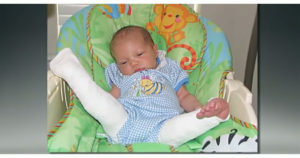 Instead, she desired only to raise as much money as possible for the place that had fixed her legs. As per reports, her aim was to raise around $8,000 for the Texas Scottish Rite Hospital for Children. A lofty goal, one might agree, but she was undeterred. Of course, no sooner had the media caught wind of Addie’s story did a drive begin that would culminate in all of her expectations being exceeded. People Magazine picked up her story and propelled it into the mainstream window, culminating in an outpour of donations from all over the country. All told, Addie was able to raise around $19,500 for the hospital through the donations … but that wasn’t even the end of it. It wasn’t long before the hospital’s Vice President of Development, Stephanie Brigger, received a check made out to Scottish Rite. It was from an unnamed sender who was apparently so impressed with Addie’s work that they themselves donated an incredible $50,000. “I am almost speechless because I am the one who opened it,” Brigger said. 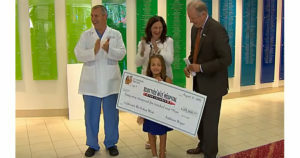 Addie’s work was able to contribute to a whopping $70,000 being raised for Scottish Rite Hospital! I think it’s obvious that we can all learn from Addie’s powerful story, and in the very least be inspired by her actions. Through sheer compassion and will she was able to raise a truly fantastic amount for a hospital that had helped her when she needed it most. We are all capable of so much more than we might ever realize. 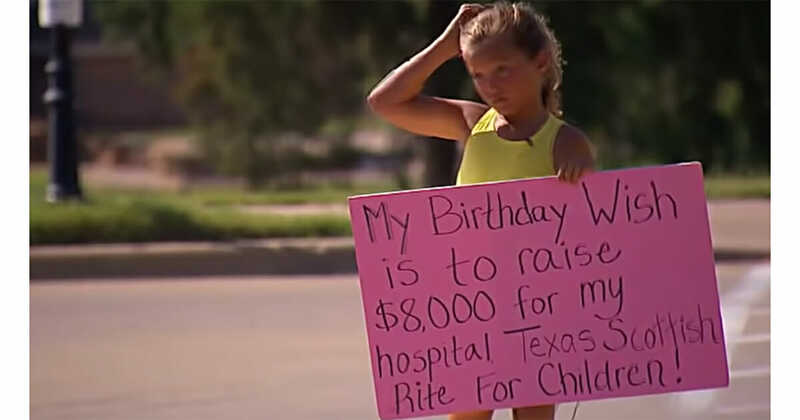 For Addie, to achieve a dream all it took was standing on a street corner with a sign she had made herself. From there, she was able to change the lives of so many people. Share this story so that more people can be encouraged to do small bits of good in their everyday lives. It doesn’t need to be a grand gesture, or even any huge show of charity … so often it’s the small things that cause the biggest ripples in the pond of positivity. Help us pay tribute to young Addie Bryan!